Sometimes when we see that a recipe is vegan or vegetarian, we automatically that it's going to taste bad or lose flavor. But some recipes are naturally vegetarian or vegan, without making any special effort. 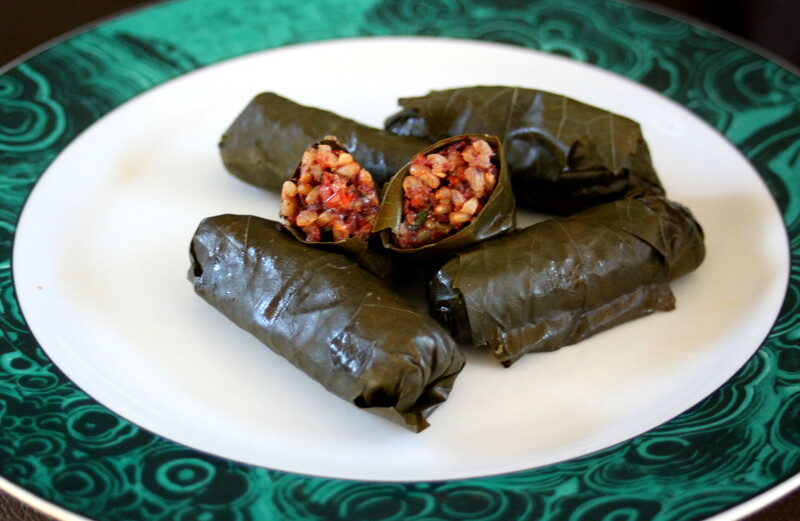 Stuffed grape leaves are almost always a vegan recipe and today is no exception. First, this is a GREAT tapenade recipe all by itself. I love the mild roasted garlic and roasted red pepper. The sun dried tomato makes it extra sweet and the kalamata olives give it that great, salty flavor. It has beautiful color, great balance and LOTS of wonderful flavor. It was hard not to eat the tapenade all by itself! Second, one jar of grape leaves is enough. It doesn't look like much in the jar, but they're rolled up really tight and packed into the briny solution. Once you rinse and blanche them, you'll see that you have more than enough. I found the ones I used at Fry's (a Kroger chain store), so they should be available in your grocery store in the Italian section. In a medium saucepan, bring the vegetable broth to a boil. Add the rice, cover and reduce heat to a simmer. Cook until broth is absorbed and rice is soft, about 20 minutes. Remove from heat and allow to cool. Cut the red bell pepper in half lengthwise and remove seeds and membrane. Peel the garlic clove. Place the bell pepper and garlic on a cookie sheet and place in the broiler for 4-5 minutes on each side. Remove from oven, roughly chop and transfer to a food processor. Add the olives, capers, parsley, basil, lemon juice, chopped scallion and sun dried tomatoes to the food processor with the peppers and garlic. Pulse until items are combined and chopped. Drizzle in olive oil, season with salt and pepper to taste and pulse again until items are very finely chopped. Transfer mixture to a large mixing bowl. Add the rice to the tapenade mixture, drizzle in the remaining olive oil if mixture is dry (optional) and stir until combined. Prepare the grape leaves by removing them from the jar and rinsing them well. 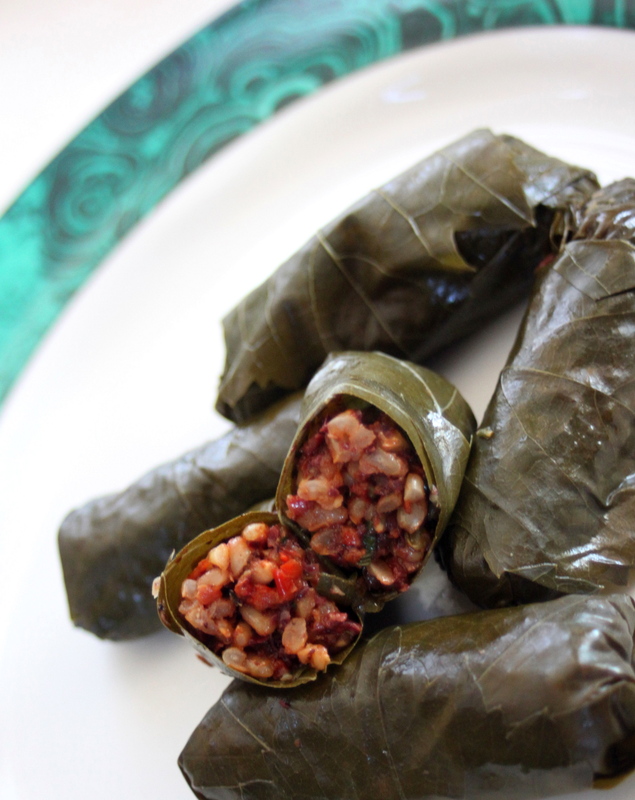 Bring a large pot of water to boiling and place the grape leaves in the boiling water for about 1 minute. Transfer to an ice bath, lay them flat and pat them dry with a paper towel. To stuff the leaves: Lay one leaf flat and place about 1-2 tbsp. of stuffing toward the bottom, center of the leaf (depending on the size of the leaf). Roll the bottom two sections up over the stuffing. Fold the two side sections in, sealing the ends. Roll the leaf up toward the top section of the leaf, sealing it off. Repeat with the other leaves, until the tapenade is gone. Refrigerate until ready to serve.